Last weekend I was up at the Inter-Varsity Folk Dance Festival (IVFDF). Essentially it's one massive festival of ceilidhs - traditional Scottish country dances. There were some other workshops thrown in, but essentially, apart from eating and sleeping, I spent 36 hours on my feet dancing. It was epic and exhausting. It was such a great atmosphere. My friend Matt, who helped introduce me to ceilidhs, was there too but there's not often a place and time to have so many younger ceilidh dancers in one room together. Between the many many many dances there were opportunities to hit the pub and spend hours playing music and singing folk songs (most of which are rowdy and rude. You know, proper pub songs! ), learning new tunes and steps off complete strangers, and indoor camping. They'd got us a hall to sleep in, but of course that turned into another ceilidh that lasted until 2:30 in the morning with my friend's brother Bob doing the calling and the musicians from Warwick ceilidh society providing the tunes. I couldn't even last that long and ended up sleeping in one of the back rooms. Apparently we weren't really meant to be in there, but by the time we were told that it had been judged too grimy and cold for sleeping, the dozen of us that were already bedded down there just grumbled "So it's like real camping then. Consider us informed. Good night," rolled over and went to sleep. The Saturday was full of workshops for dancing and other things (bizarrely I spent an hour learning how to knit - more on that some other time). Sadly I couldn't stay for the Sunday too, but I certainly got my money's worth! 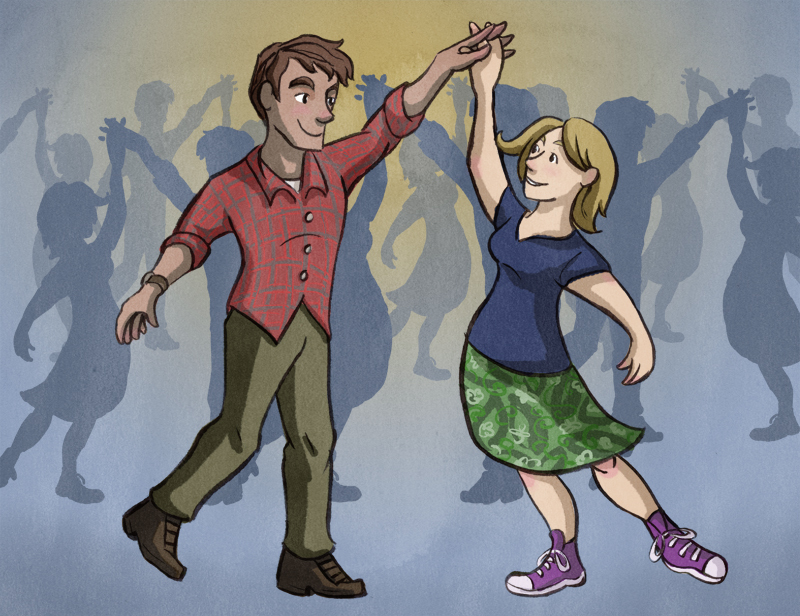 I love ceilidh dancing. In a lot of ways I find it more fun than clubbing, since it's deliberately designed to make you socialise. Everyone is taught the same steps before you start a dance, and those steps will often have you swap partners mid-dance. You get a lot of face time with your partner, and there's often chances to chat within the dance itself. It's actually expected for you ask a complete stranger to dance if they're left on their own, and to thank them afterwards. I was often surprised by my own reactions - I wasn't overly keen on some of my partners when they asked me because... well sometimes we're all more shallow than we'd like to admit. But in both cases they turned out to be really fun guys to dance with, and in one particular case I went from thinking "Oh no!" to being quite into him by the time the dance finished. I gave him a chance, danced with him, and he showed his character. I was impressed! Hopefully I made a pretty good account of myself too, for all I'm still learning. Of course you then recognise these people, and can go up and speak to them afterward with the perfect icebreaker "Hi. Didn't I do that reel with you last night?" In our individualistic world there's something really nice about a way of dancing that helps you make connections with the people around you. Even though I know it's the norm, I'm always flattered every time it happens. Some of it does amuse me though. This socialisation thing used to be the only chance that young men and women got to meet each other, and they're mostly pretty platonic dances by our standards so I do find it pretty funny that some of this used to be 'That radical new dance that the kids were doing.' They're holding hands while promenading through the circle? Perish the thought! Morality is at an end! You don't get tinnitus from ceilidh music either, which is always very nice! We had some great bands; Hekety, and the ever-awesome Blackbeard's Tea Party, who kept throwing random movie tunes into the mix. Suddenly the Gay Gordons becomes the Mission Impossible theme. Well played BTP. Well played.